Mutual Aid in Caguas (PR) + La ZAD Wins? 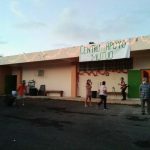 In the first segment, we hear from two organizers with the Centro de Apoyo Mutuo or Mutual Aid Center in Caguas, Puerto Rico. Emilu and Kique talk about Caguas, about the colonial relationship between the U.S. mainland and Puerto Rico, the post-hurricane disaster relief they’ve been doing as a continuation of social organizing in the wake of that colonialism, and building a network of C-A-Ms around Puerto Rico. More on their project can be found on fedbook. Then we hear from Camille, a resident of the ZAD in Notre Dame des Landes in Western France. Camille shares the news of the recent French government statement that they are cancelling the planned airport in NDDL, which has been a goal of social movements and the land occupation at the ZAD. More info on that project can be found at zad.nadir.org. To hear our past interviews on the ZAD, check out this initial interview, this response to major demonstrations in Nantes, this conversation with participants at ZAD du Testet, this response to the police killing of Remi Fraisse in relation to the ZAD du Testet and this interview from Dissident Island Radio about State of Emergency. TOMORROW January 22nd is the 3rd annual Trans Prisoner Day of Solidarity as initiated in 2016 by eco-anarchist prisoner Marius Mason. Last year’s call-out, plus a list of some events around the U.S. can be found at itsgoingdown. If you’re in Asheville, Tranzmission Prison Project will be hosting a card signing event and discussion at 7pm at Firestorm Books and Coffee. Cards will be supplied and it’s suggested to bring vegan snacks to share. Charlottesville, VA: Mr. Donald Blakney was arrested at his home on Friday by Charlottesville Police Department (CPD). He is charged with Malicious Wounding — a felony that carries a 5 year minimum and the possibility of up to 20 years in prison. On August 12, he was physically attacked by a participant in the Unite the Right rally, who also yelled racist slurs at him. Later that fall, he was questioned by CPD and the FBI under the pretext of the ongoing criminal investigation into right-wing violence that day. The charges against Mr. Blakney are apparently based in part on a video broadcast by the ABC News program 20/20 that depicts him at the scene. Mr. Blakney is the third counter-protester to be arrested and charged arising out of the events in Charlottesville on August 12, 2017. Corey Long and DeAndre Harris are both also facing criminal charges. All three are Black men and local residents who were attacked that day. Mr. Blakney was released on personal recognizance Friday. He has an arraignment tomorrow, Monday January 22 at 10AM in Charlottesville General District Court and is requesting that supporters come in solidarity. Mr. Blakney is represented by attorneys Sandra Freeman and David Baugh. The Heat is On: Update from Blue Ridge ABC on Week 1 of #OperationPUSH! One week ago prison rebels across Florida launched Operation PUSH. Their demands were simple: end prison slavery and price gouging, restore access to parole, and put an end to the brutal conditions they are subjected to daily. Information has been slow to trickle out due to intense repression and communication blackouts, but we know there has been strike participation at 15+ prisons, and we know that support on the outside is growing, with 150+ organizations endorsing the action and major solidarity actions in Florida occurring at various locations, including a 5-hour long occupation of the DOC office in Tallahassee on Tuesday. The repression is already starting to come down: people being thrown into solitary confinement; being threatened with violence; being bribed to end their action and inform on other strike organizers; being transferred to new facilities to disburse strike activity throughout the system and isolate people. One disturbing feature of this repression is DOC’s focus on identifying specific groups coordinating support on the outside such as the Campaign to Fight Toxic Prisons and IWOC and disrupting prisoners’ communication with these groups. But strikers won’t be fooled so easily, and neither will we. We will keep showing up because those on the inside are putting it all on the line, and we are in absolute solidarity with their courageous acts of resistance. NOW IS THE TIME TO STEP UP OUR SUPPORT! – Join the “phone zap” (calling campaign” TOMORROW, MONDAY 1/22! Go to incarceratedworkers.org to find the call script and make those calls! Yesterday marked the year anniversary of January 20th, 2017. The by now all too familiar litany of charges, events, numbers, police tactics, and trials sometimes bears repetition at, but at other times can obscure the human element at play, lives that have been varying degrees of upended or lost in this process. Three days ago on January 18th 2018, 129 of the original defendants were acquitted of all charges “without prejudice”, a phrase that sounds benign and even somewhat positive. In actuality, it is in place here to protect the plaintiff (in this case, the state) from the defendant (here, the 129) invoking a doctrine called Res Judicata (meaning “a thing decided” in Latin), which essentially states that someone cannot be brought up on charges for the same thing twice. I think it is important to belabor this point, not in any way to nay-say the relief that anyone may be feeling right now or diminish some very very well deserved congratulations, but to say again and again that the state is not here to give anyone who opposes it relief, or joy, or a sense of justice. The daily realities of so many of us who resist the state by our actions, beliefs, or our very existence is proof enough of the state’s essential nature. This phrase “without prejudice”, when used in the case of a dismissal of charges, means legally that the original charges could be brought again at any time, as though those charges never existed in the first place. This is a very smart move on the part of the courts. It seems very likely that this was a carefully timed mass acquittal, having little to do with meting out so called guilt or innocence, and everything to do with attempting to fracture support and stymie momentum. They can be seen to be throwing us a bone while actually going ahead with their original intention. What is unfortunate for the courts is that support for the J20 defendants is not being taken in by this tactic. This is a time for us to focus all our resources on the remaining 59 defendants, keep an eye or two on the shenanigans of the court trying to pull legal fast ones over on our comrades, and take care of ourselves and each other cause this is far from over. You can see a beautiful statement of solidarity with the remaining defendants at defendj20resistance.org, and as always, keep up with developments in this case by following the hashtags or handles related to “defendj20” on all your fav social media platforms. To see a list of actions and endeavors in this anniversary week, you can go to itsgoingdown.org. You can help support the defendants by going to their fundraising support page.